When creating an evaluation, administrators can specify if support accounts can be assigned to an evaluation as an evaluator. This is helpful if your institution utilizes external reviewers for performing evaluations a support account can be set up for the external reviewer so they can perform the evaluation. 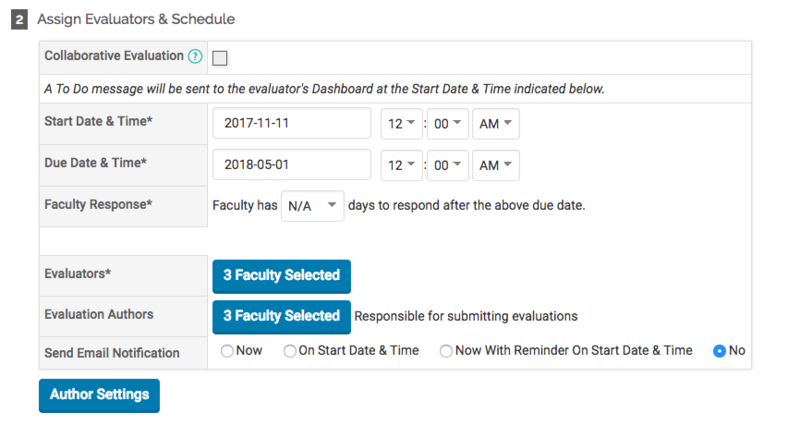 If an evaluation has been assigned to a support account, an Evaluation link will display in the Faculty menu for that support account a notification message will not display on the dashboard. If a support account has an evaluation associated with it, the support account cannot be deleted from FACULTY180. The option to include/exclude support accounts as part of an evaluation is available when selecting faculty to serve as evaluators. Click Evaluations in the Evaluations section. The Evaluations screen displays. Click Add. The Evaluation Form screen displays. Specify the evaluation details. When you are finished, save the information. The new evaluation has been added to the review process. 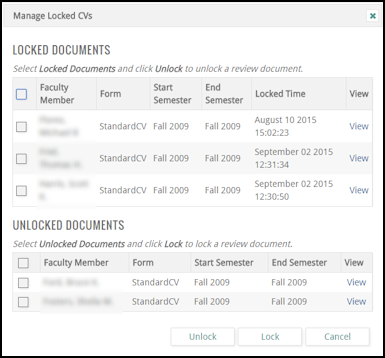 Administrators can unlock and relock vitas that were locked previously for an evaluation. Click the Manage Locked Vitas link - the Manage Locked CVs dialog box opens. Select the unit associated with the evaluation you wish to view. The Evaluations screen displays, showing a list of existing evaluations and their associated evaluation process. If necessary, use the filters to select the type of evaluations you wish to view. Click the Completed link for an evaluation to view which evaluations have / have not yet been submitted by evaluators and authors. Evaluations that have already been submitted can also be viewed. 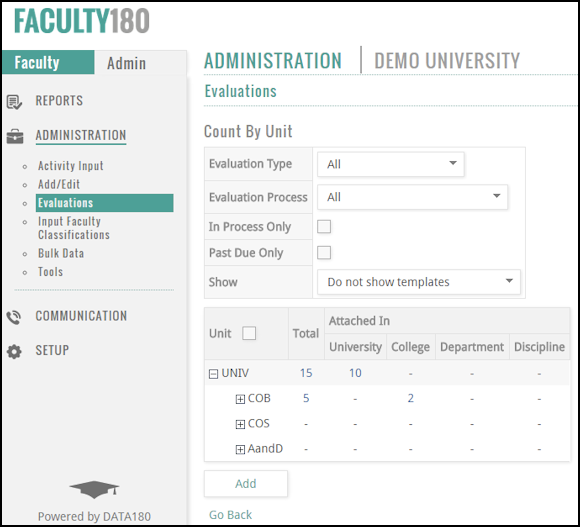 Select the unit associated withthe evaluation you wish to edit.The Evaluations screendisplays, showing alist of existing evaluations and their associated evaluation process. Click the Edit icon adjacent to the evaluation to be changed. Make the desired changes, then save the information. If you want to add a new evaluator to a step that is in progress, you must have the proper permissions or administrator rights. Click on the Administrator tab and select the Administration link. Choose the relevant department and search for the relevant step of the process.